ROME, Italy, July 5, 2011 (ENS) – Thousands of protesters from across Europe clashed with Italian police Sunday while demonstrating against a high-speed rail (TAV) tunnel linking Italy and France. 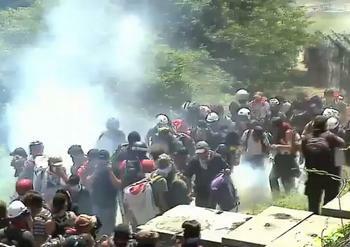 Police used water cannons and tear gas to break up the demonstration. After the protests left about 200 police injured, the Italian interior minister Monday urged prosecutors to press “heavy” charges. “I consider it attempted murder,” said Interior Minister Roberto Maroni. Police have made four arrests and are searching for another suspect. They were “a group of thugs looking for victims,” Maroni told the Italian news agency ANSA, referring to protesters who threw Molotov cocktails at police near the construction site in the Alpine town of Chiomonte. 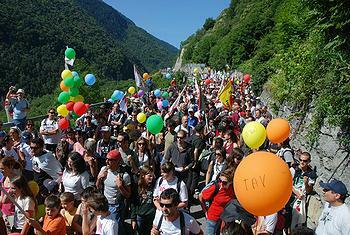 The demonstrators contend that an area of outstanding natural beauty will be damaged by the construction of a 58-kilometer (36-mile) tunnel in northern Italy’s Val di Susa area near Turin. Supporters of the TAV project – most Italian political parties and the European Commission – say the high-speed rail line will cut pollution by reducing the need to haul freight by road between Italy and France. The grassroots protest group called “No TAV” (No to the high-speed train) said that 50,000 demonstrators came from all over Europe Sunday, but police say they counted about 6,000. At least six of the protesters were taken from the site by ambulance and 15 more received first aid. Demonstrators have used rocks, tree branches and incendiary devices to confront police and disrupt the project in several incidents over the past week. Last week a clash left 28 police officers injured, including five who were hospitalized, after a riot squad broke up a human blockade. Alberto Perino, the leader of the No TAV movement, said demonstrators in Sunday’s march would have “bare hands and clean hands, against those whose hands are neither bare nor clean,” local media reported. One participant in Sunday’s march who has been protesting this construction for 10 years, says that this year “at least a hundred boys dressed in black, with knitted caps … with accents of other regions” joined the march. She believes they are responsible for the clashes with police, disrupting what have been peaceful demonstrations in years past. Calling herself only Elena, the demonstrator said the protest movement must distance itself from these fringe elements. Construction on the high-speed rail tunnel resumed Monday. 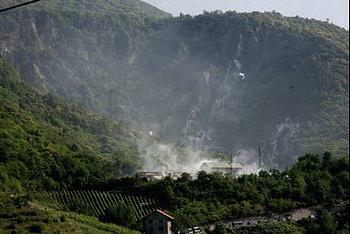 Work on the main tunnel, of which 12 kilometers (seven miles) are in Italy, is scheduled to begin in 2013. The high-speed train is expected to go into service around 2023. Twenty-three local mayors are against the project, agreed by Italy and France in 2001, to build the high-speed link, which would trim three hours off the current seven-hour travel time between Paris and Milan.